Two engineers working in the nacelle of a Siemens offshore wind turbine. 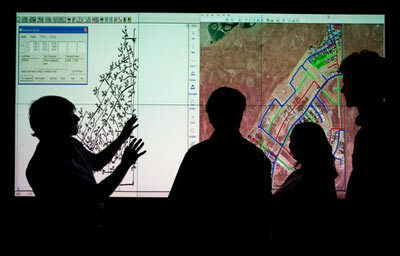 Photo by Siemens AG 2011, courtesy of NREL. Provenance: Photo by Siemens AG 2011, courtesy of the National Renewable Energy Laboratory. Image 19687. The National Academy of Science's 2013 report, Emerging Workforce Trends in the U.S. Energy and Mining Industries: A Call to Action, describes the employment outlook in a number of industries. The following section summarizes job prospects in the emerging energy sector. Employment data is difficult to categorize because employment data from the Bureau of Labor Statistics is not broken down into individual types of energy outside of oil and gas. Nonetheless, data about renewable energy employment is gathered by trade groups and can be tracked by industry metrics. Job growth is expected to follow industry growth, with projections made by the Energy Information Administration and by trade groups. Job growth is dependent on factors such as the availability of government tax credits, incentives or mandates for renewable energy growth. These can be difficult to predict. Job availability is geographically distributed in locations where the most installations are occurring. Employees with Lighthouse Solar, install microcrystalline PV modules on top of a town home. NREL Photo by Dennis Schroeder. Provenance: Photo by Dennis Schroeder, courtesy of the National Renewable Energy Laboratory. There were 119,016 solar jobs in 2012, according to The Solar Foundation's 2012 National Solar Jobs Census. 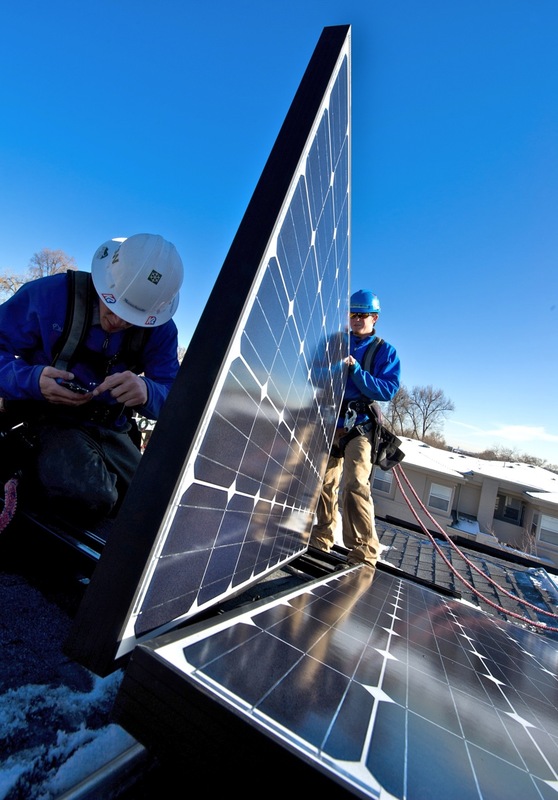 Jobs in solar energy are expected to grow by 17% in 2013. According to Energy Information Administration data on the growth of solar energy, strong job growth is expected, reaching as many as 290,000 new jobs by 2030. Types of solar jobs include installation, manufacturing, sales and distribution, project development and others (NAS, 2013). The most recent employment data is from the American Wind Energy Association, which estimates 75,000 jobs in wind energy in 2010 and 2011. However that is a drop of 10,000 jobs from 2008 and 2009. As wind power installations vary with geography, the jobs mirror this trend. The most jobs are in Texas, Illinois and Iowa. 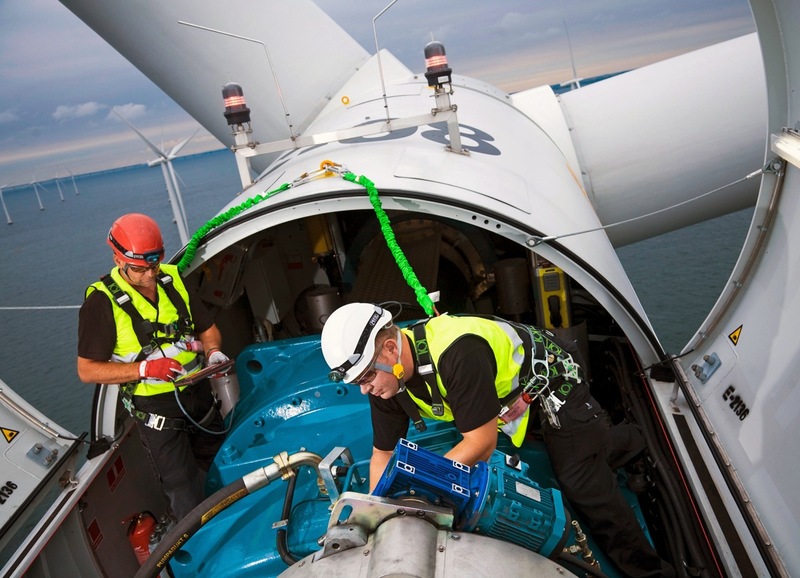 Environmental and geoscience jobs in the wind industry include: surveying, geotechnical engineering, geotechnical testing, environmental management, safety and environmental health, resource assessment, wind production data analysis, wind power forecasting, community liaison, regulatory/government liaison, energy analysis/auditing and GIS specialists. Additional expertise is required in site environmental analysis and measurement, permitting, and site and geological survey. Offshore wind development will require knowledge of marine environments. A senior geothermal analyst from the National Renewable Energy Laboratory examines a heat sensor to make sure it's in working order before the wire attached to the sensor descends 500 feet under the IKEA store construction site in Centennial, Colorado. This store is being built with geothermal heating and cooling. Image courtesy of DOE/NREL, Credit - Patrick Corkery. Provenance: Image courtesy of DOE/NREL, Credit - Patrick Corkery. The geothermal industry currently supports approximately 5,200 jobs. The Energy Information Administration projects a 4% annual growth in geothermal energy, which could lead to nearly 8,000 new jobs by 2035. Geoscience expertise is most needed during exploration phase of a geothermal power plant. Geoscientists with graduate and undergraduate degrees make up approximately 14 to 32 employees in a typical 50 megawatt power plant installation; such an installation would employ 700-862 people in jobs ranging from drilling and logging to engineering and plant design. Complex geothermal projects such as enhanced geothermal energy will demand particular expertise. The NAS report summarizes the need as follows, "Many more scientists experienced in seismology induced by geothermal stimulation and operations as well as scientists and engineers with expertise in rock mechanics will be required. Experience in diverse geothermal geological settings, rock types, and stress regimes will be needed. Interdisciplinary training... will be needed to meet this requirement." The geothermal industry shares several skills and technologies with the mining, petroleum and hydrology industries. On one hand this can help with workforce development as the geothermal industry grows. However, with the high salaries available in the extractive sectors it may be difficult to attract workers away from more lucrative careers (NAS, 2013). Carbon capture, use and storage are technologies used to enhance oil recovery as well as to sequester carbon dioxide and prevent atmospheric emissions. Projection of the workforce needed to implement carbon capture, use and storage (CCUS) is difficult because the demand for this industry is largely driven by public policy. Without restrictions on US carbon emissions, the industry that supports carbon capture and storage will not be fully developed. Hence, employment projections vary widely from 14,000 up to 100,000 workers by 2030, depending on the degree of implementation of carbon capture and storage. Management Services Inc, lists additional types of policy or economics work related to CCUS such as emissions accounting and reporting, emissions reduction credit market analysis, energy trading and analysis, and policy analysis. Energy analyst Roger Bezdek forecasts carbon management will create a profound impact on the geoscience workforce, with economic and job forecasts of $200 billion annually and 1 million new jobs. While this is good news for the job prospects of geoscientists, it also presents a daunting challenge to prepare and train sufficient workers to sustain a large CCUS initiative. While some forms of work are based on existing technologies and job descriptions, CCUS is also expected to bring emerging technologies and new types of jobs to the workforce. As it takes 5-10 years to produce a professional scientist or engineer, there may be a shortfall of workers while the industry ramps up (Bezdek, 2013). This analysis of our ability to supply the workforce for CCUS differs from that of the National Academies, and additional uncertainty hinges on the regulatory environment that would give rise to restrictions in carbon emissions. Thus, this industry remains one to be watchful of, both for its ability to contribute toward the mitigation of climate change and also for the potential impacts to geoscience education, training and workforce development. Staff and student looking at the class materials for the Power and Energy Engineering Practice School. The practice schools is a collaborative effort between NREL and the Schools of Mines. Surveys conducted by GreenBiz in 2010 and 2011 sought to characterize sustainability activities at the executive level among large and small US companies. The 2012 survey drew from 536 respondents working in sustainability. Although there are only two years of data, some inferences may be drawn. The 2011 survey found that sustainability is gaining ground as a job title and as a focus of employment for high-level employees. In 2011, 86% of large companies had at least one full-time employee who spends all of their time working on sustainability. In 2010 this was 81%. Sustainability is a part of high-level, executive jobs; 38% of the companies surveyed employ a sustainability executive at the Vice President level, with 34% at the Director level (Davies, 2011). A trend reflected in the 2010 and 2011 surveys is the increasing importance of reducing energy consumption. For large companies, 48% of respondents employ a dedicated energy manager. A company's motivation to address sustainability may be to reduce costs, generate revenue, enhance their reputation or attract talent. The survey showed that the sectors of consumer goods, automotive companies and basic materials were most likely to view sustainability as a core strategic consideration. About half of the companies surveyed have a dedicated budget for their sustainability program. The size of sustainability budgets increased between 2010 and 2011. Similarly, the size of employee teams working on sustainability grew over this same time period. Job satisfaction is high; the number of employees describing themselves as "satisfied" or "very satisfied" was 85% in large companies and 79% in smaller companies. Average annual salaries for executive-level sustainability employees range from over $200,000 for vice presidents, to around $160,000 for directors. At both levels, men outnumber women and males make 11 to 20 percent more income than females. These employees hold either bachelor's or master's degrees, and there is no clear correlation between salary and the level of education. At the level of manager, the average salary is $105,000 and there is closer parity between men and women, both in terms of numbers of workers and salary. Sustainability managers with graduate degrees earn more than those with bachelor's degrees (Davies, 2011). Emerging Workforce Trends in the U.S. Energy and Mining Industries: A Call to Action (2013), by the National Academy of Science, Board on Earth Sciences and Resources. Findings and Recommendations of this report. Utilities Seek Fresh Talent for Smart Grids, New York Times, published December 29, 2010. Photo by Siemens AG 2011, courtesy of the National Renewable Energy Laboratory. Image 19687. Photo by Dennis Schroeder, courtesy of the National Renewable Energy Laboratory. Image courtesy of DOE/NREL, Credit - Patrick Corkery. presented by Roger H. Bezdek, Management Information Services, Inc.